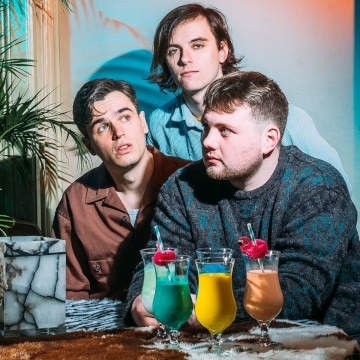 Belfast alternative rock trio Hot Cops, formed in 2013, are a self-proclaimed “good rock’n’roll band”, Consisting of Carl Eccles (guitar and vocals), Conor Ellison (Drums) and Nathan Rodgers (bass and occasional backup vocals). Hot Cops pen sky-rocketing melodies with sarcastic edge. Pairing the cathartic intensity of light and shade dynamics with slacker wit, the Belfast trio’s taut, precise, and urgently anthemic live act is not to be missed. Returning to the stage, after spending the bulk of 2018 quietly recording, the searing new single “Negative One” comes hot on the trails of the acerbic “Speed Dating” EP and NI Music Prize Single of the Year nominee “Decay”.